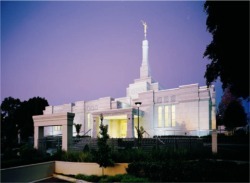 The Perth Australia Temple is the 106th operating temple of The Church of Jesus Christ of Latter-day Saints. The Perth Australia Temple is a great blessing to the 12,000 members that it serves. Previously members had to travel a distance equivalent to going from Los Angeles to New York in order to attend the nearest temple in Sydney. Local reaction to the Mormon temple was favorable. Church President Gordon B. Hinckley commented, "In view of the fact that we do not build a temple until there are sufficient people in the area, until there are sufficient tithe payers, and until there is sufficient faith, the very construction of these sacred buildings becomes an indicator of the increase of faith and obedience to the principles of the gospel." This is apparent since in just 100 years, since the first Mormon missionaries entered western Australia, Church membership has grown to 12,000 members. The Perth Australia Temple has a total of 10,700 square feet, two ordinance rooms, and two sealing rooms. This page was last edited on 1 September 2010, at 03:45.